Kid3 audio tag editor has recently reached the 3.2.0 release. Here’s how to install or upgrade it in Ubuntu / Linux Mint. 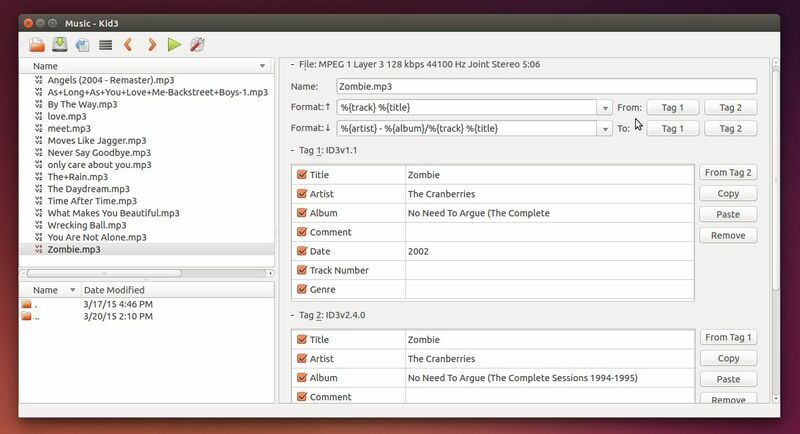 Kid3 is an open-source audio tag editor for KDE or Qt only. It supports MP3, Ogg/Vorbis, FLAC, MPC, MP4/AAC, MP2, Opus, Speex, TrueAudio, WavPack, WMA, WAV, AIFF, tracker modules. Support QML/JS scripts for user actions. Batch embed, export, and resize album art. Support build with KDE 5. Support DSF files with TagLib 1.9.1. Option to mark pictures larger than a given size. Number tracks can reset track number for each folder. Number tracks can only format numbers or set total. Only expand subtree if shift is pressed with “Expand all”. File suffix for export (e.g. picture) is determined by mime type. Image dimensions are displayed below picture. Crash when TagLib file is saved with changes in tags and file name. Deletion of picture frames from Ogg/Opus files. Setting description of Ogg pictures in frame table. Reactivate support for AAC and MP2 files with TagLib. Mac OS X: Avoid excessive memory consumption. Adapted to Amazon server update. For Ubuntu 12.04, Ubuntu 14.04, Ubuntu 14.10, and Linux Mint 13/17, Kid3 3.2.0 is available for install/upgrade in the developer’s PPA. Nice app, i like it… thanks.